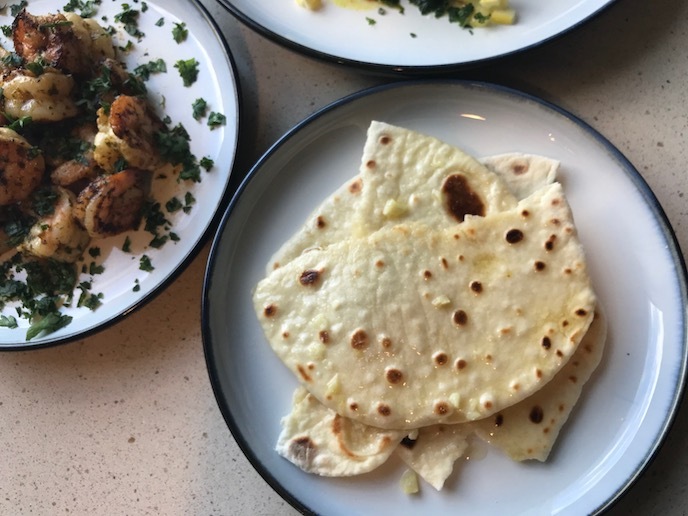 Fresh Indian naan flatbread is one of the main reasons to go out for Indian food. But if you can make it at home, you can save tons of "dough" and utilize this recipe for many styles of world cuisine. 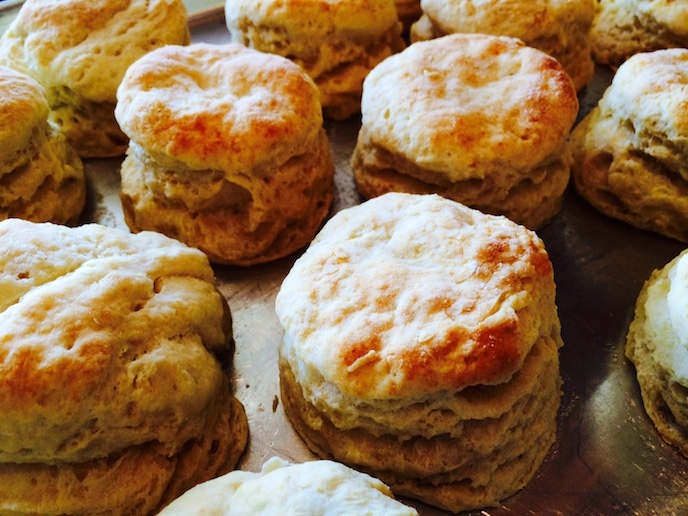 While baking is not my thing, this recipe is really easy and a huge crowd pleaser. You can cook this on the stove top, pop it on a grill or use a really hot oven. The naan comes out tender and tasty everytime! Mix the water, yeast and sugar and let rest for 10 minutes. The yeast will begin to bloom and become puffy at the top of the bowl. Place the flour, salt, yogurt and oil into a mixing bowl, pour in the yeast mixture then mix to form a ball of dough. Kneed the dough for 5 minutes on a floured surface until it is smooth. Cut the dough into 8 pieces, place on a lightly oiled baking sheet, cover in plastic and let rise for an hour. Pre heat a heavy skillet over medium high heat. Lightly flour your work surface and roll the pieces of dough out very thin. Place the dough on the skillet, cook for 30 seconds, turn and repeat. The dough will start to bubble immediately. Baste the finished naan with ghee/butter and sprinkle with kosher salt. It is no secret that I LOVE TACOS! One day I was making a fresh batch when I looked in my cabinet to find no tortillas, hard or soft. This life problem gave forth to one of the greatest cooking discoveries of my career. 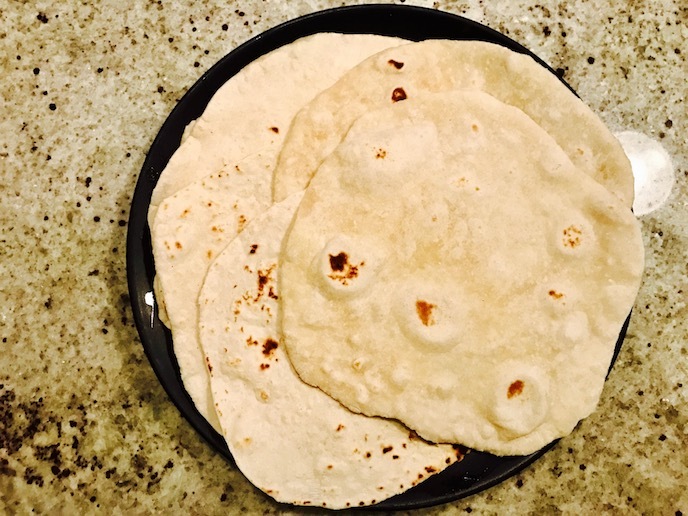 The question was, how can I make homemade flour tortillas just like they do at the taco shops? 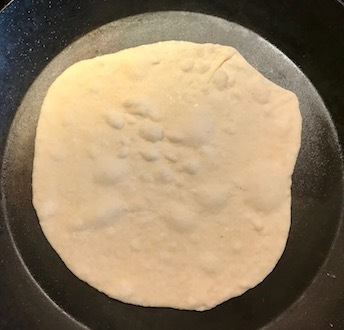 With a little research and "real world experience", I have come up with a very easy recipe and method for making soft flour tortillas. This can be used for tacos, quesadillas, chimichangas, wraps, tortilla chips and more. 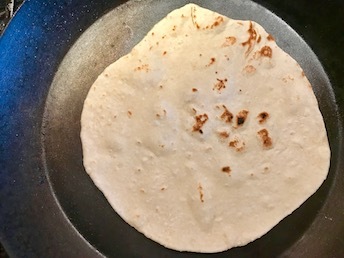 Once you start making fresh tortillas, you will never go back! Place the flour, salt and baking powder into a bowl and mix well with a fork. Add the shortening and then press it into the the flour with the fork tines until it is combined. Add the warm water and mix well until a ball of dough forms. Kneed the dough for 3 minutes with your hand then cover with plastic for 15 minutes. Cut the ball of dough into 8 pieces and let rest for another 5 minutes. Place a ball of dough onto a floured surface and then flour a rolling pin. Lightly press down the rolling pin onto the center of the dough, turn a half turn and repeat. Flip the dough over, place the pin on the middle of the dough and roll outward, up and down. Lightly re-flour the surface, dough and pin. Turn and repeat this process until the tortilla is very flat. Place a skillet (non stick, cast iron or steel) over medium high heat. Place the flattened dough into the pan and cook for one minute. The tortilla will puff up a bit, you can just press it down with your hand. Turn the tortilla and cook on the other side for about 20 seconds. Place the warm tortilla on a plate and cover with a moist towel while cooking the rest. Keep the tortillas wrapped in plastic until serving. Samosas are a classic indian hand pie/pastry that is served with a variety savory flavors. Generally a pie dough is rolled flat, stuffed with a mixture of vegetables and spiced lamb and then fried. This recipe has been simplified, stuffing a vegetable mixture into a piece of puff pastry and baking until golden brown. You can use a variety of filings including ground meats, potatoes, grains, beans and vegetables. Spices can include curry, cumin, cinnamon and garam masala (a mixture of warm spices), that can easily be purchased at the grocery store for little $$$. The technique takes a little practice, but once it is perfected you can make a big batch of samosa in no time. It is also a cool group activity. Remember to use parchment paper or a SILPAT (non stick silicon pad) on your baking sheet so the pastry won't stick! You will need a baking sheet with parchment paper or a SILPAT (non stick silicon pad). Pre heat the oven to 425 F. Place a large pan over medium heat and add the olive oil to the pan. Place the sweet potatoes and onions into the pan and cook for 5 minutes, tossing every minutes. Add the next 4 ingredients and cook for 5 minutes, tossing every minute. Add half of the salt, pepper, cumin and curry and cook for 2 minutes, stirring constantly. Add the water and let simmer for 10 minutes or until the water has evaporated and the sweet potatoes are soft. Season the mixture with the rest of the spices to suit your taste and stir in the lime juice. Let this mixture cool to room temperature or chill completely. Take the defrosted puff pastry out of the fridge and place both sheets on a cutting board. Mix the egg and the water in a small bowl and set aside. Cut each sheet into 9 equal squares. Take one square and lightly roll it out and rub/paint a small amount of the egg mixture in the 4 sides. Place 2-3 tablespoons - a golf ball sized scoop - of the vegetable mixture in the middle of the square. Pull the 4 corners together with one hand and pinch tightly. Use your other hand to seal the seams together, creating a four cornered pouch of awesomeness. Place the pastry on the lined baking sheet and continue until you have formed 18 samosas. Paint the remaining egg mixture over the pastry and sprinkle with sesame seeds. Place the samosas into the oven and bake for 10 minutes, rotate the pans and cook for 8 minutes or until golden brown. You can serve samosas with homemade or store bought chutneys, sweet chili sauce or fresh salsa. Pre heat oven to 375 F and butter an 8-inch baking dish with 1 tablespoon of butter. Mix the peaches with the sugar, lemon juice and cornstarch and place into the baking dish. Mix the butter, brown sugar, flour and oats together until a crumble if formed. 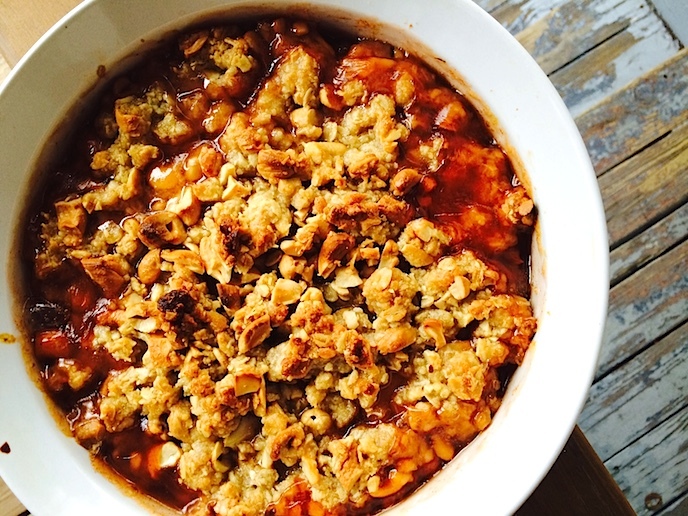 Place the crumble over the peaches, lightly top with foil and bake for 40-50 minutes or until golden brown. Summer time is the right time for fantastic fruit flavored desserts. Pies, tarts and crumbles are some of my favorite hot weather desserts, but the French galette is a true crowd pleaser and you dont have to be a pro baker to make it. A galette is like a pie without a pan, filled with a fruit filling and topped with ice cream, whipped cream or powdered sugar. I like to make this dessert because the prep is easy and the outcome is wicked awesome! You can make the dough from scratch or use store bought pie dough, crescent dough and puff pastry. The fruit filling can be made from all types of berries, and other summer fruits like cherries, peaches, plums and even rhubarb. And remember if you can't get fresh fruit, frozen will work great too. Pre heat the oven to 425 F and line a baking sheet with parchment paper. The parchment will keep your baking sheet clean and make the surface non stick. Remove the dough from the fridge and place on a surface dusted with flour. 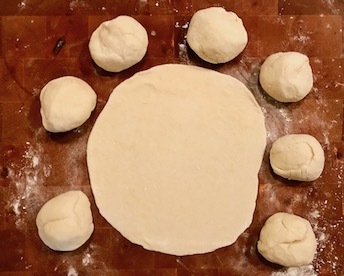 Roll the dough out into a large circle about 13 inches wide, don't worry about creating a perfect circle. Place the blueberry filling in the middle of the dough, and leave a 2 inch border. 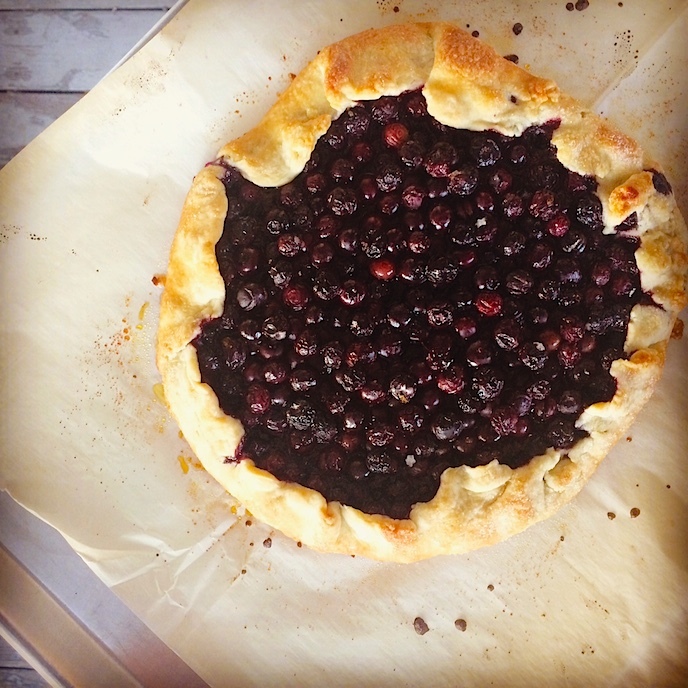 Carefully fold the dough up and around the blueberry filling to create crust, overlapping the dough is all good. Brush the edges of the galette with the milk and then sprinkle with sugar. Bake for 35 minutes or until golden brown, turning halfway through cooking. Remove front he oven and let cool until serving. Place the flour, salt and sugar in a bowl and toss to combine. Place the butter chunks into the mixture and press into the flour with your hands until the mixture is crumbly. Mix in the ice water and press the flour mixture into a ball of dough, the mixture will be crumbly. Wrap the dough ball tightly in plastic and flatten to form a disk. Place in fridge and chill for 2 hour or until very firm. Place all of the ingredients into a bowl and toss to combine. Pre heat the oven to 450 F. Mix the milk and vinegar in a bowl and let sit for 10 minutes to create buttermilk. Place the flour, salt, soda, powder into another bowl and whisk well. Place the butter into the dry ingredients, quickly smash the bits of butter into the flour using your fingers or a fork. Once you have pea sized pieces of butter in the flour mixture, slowly mix in the buttermilk mixture and stir until a dry dough forms. 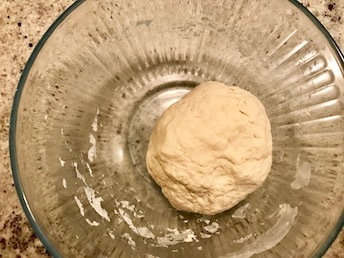 Place the dough onto a floured surface and lightly pat out into a 1 inch square, cut in half, stack on top of the first piece and pat down into another 1 inch square. Make sure you are very gentle with the dough. Repeat this 2 more times create the flakey texture. Pat the dough out into a 1 inch circle. Use a 2 inch floured cookie cutter or floured glass to cut out the biscuits, place them on a baking sheet and bake for 10 minutes or until golden brown. Jason E Lawson said: Very good :-) Worked on this while in Baltimore with Chef Egg. Excellent!